There’s no doubt that Israel is the world’s most liberal and tolerant society even by the yardstick of the truest democracies. It’s hard to envisage a comparable situation where a society in the throes of a cruel war puts up with voices in its own parliament that plainly give succor to the enemy. The question is whether this isn’t tolerance-gone-too-far, especially when cowardly atrocities against children are brazenly condoned and justified. Zoabi indeed is an old hand at skewing the truth and championing terrorism. 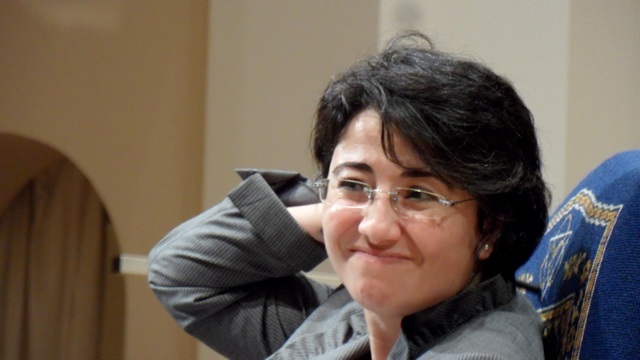 Zoabi feigns innocence as a promoter of democracy. Her bottom line is that Israel’s disappearance as a Jewish state is democracy’s praiseworthy, progressive objective. To oppose said objective is undemocratic. It might as well be admitted right off, frustrating as it may be, that she is immune from any penalty. Attempts to prevent Balad and her personally from running to the Knesset were twice scuttled by the Supreme Court on “freedom of speech grounds.” Zoabi won a license to say and do anything. This earned him scathing vilification from Haneen Zoabi, death threats even from within his own family and the need to provide him with round-the-clock police protection. Freedom of speech apparently doesn’t apply in his case and he had to suspend all online activity. This travesty must make us wonder about the jarring absence of indignation and revulsion from Israel’s Arab sector. It’s as if a courageous teen’s support of Israel is treason but there’s approval – be it outspoken or tacit – for Haneen Zoabi’s none-too-concealed subtext that no limits exist to what may be done to any Israeli, of any age, of any gender and of any status, because Israelis (and by extension Jews) bring it on themselves. Israel, she determines with impunity, is the incontrovertible villain of the Mideastern saga – the mega-slaughter in both Syria and Iraq notwithstanding. His mother must be very proud of him. Very courageous. Very idealistic. Very sixteen. The url to youtube was deleted. I guess you have to look it up yourself. It’s worth it. google |Interviewing Mohammad Zoabi| it’s a 17.27 minute video. I’m sure people can look it up on their own. Great words, Sarah! It’s a shame we will continue paying Zoabi’s salary. She doesn’t think kidnapping is terrorism. How does she feel about hijacking? Can the presence of a large aluminum object make such a difference? Does she travel by air, say to the US? Here’s a shekel’s worth of Alka-Seltzer: Does Israel have gerrymandering? Is Balad in the West bank? If not, it might be possible to re-draw, or gerrymander, Haneen Zoabi’s district, and thus deprive this Trojan horse enemy MK of her Knesset seat. Just a thought. Mohammed Zoabi? Very courageous young man; very inspiring.